Riding his Pro Bike Suzuki, Dan Cryderman won the Pro Bike & Sled event on the Cayuga Dragway of Toronto Motorsports Park during the track’s Victoria Day Weekend Challenge. Presented by Wiseco Performance Products, the race was the first completed event in the 2013 PBSS season. For Cryderman, of Thamesville, Ontario, the weekend presented some challenges, but he was able to overcome the odds both on and off the track to take the win, his third event victory in PBSS competition. "We had a couple of lucky breaks, but everything worked out," said Cryderman, who had to change clutch parts between prior rounds on his 1570-cc Vortex II-powered Raceworks Canada motorcycle. Qualifying third in the field, Cryderman went through the ladder to meet up with Lancaster, New York’s John Schwartz in the final. Schwartz, also riding a Suzuki, qualified in second place, and gave Cryderman a run for his money in the final. Cryderman posted a winning 8.02-second, 156.19-mph run against Schwartz’s 8.01, 162.07, who tried to catch Cryderman, but Cryderman’s .017-second reaction time off the line versus Schwartz’s .102 helped Cryderman get down the track and over the finish line sooner. Cryderman said after he enjoyed the close final round. "It is a lot of fun racing with Butch (Schwartz)," he said. "I really enjoy racing close like that." Qualifying number one was John Orfanidis of Toronto with a 7.750, 170.13 on his Pro Bike Suzuki, but he could not make the elimination rounds. Schwartz qualified with a 7.973 and Cryderman a 7.988. In first round action, Cryderman eliminated Marty Kuiack of Milton, Ontario, and Schwartz took out Curtis Beck, also from Milton. Pete Stewart of Toronto, Ontario was Schwartz’s next victim, and Cryderman eliminated Rob Barwick of Toronto. In the semi-final, Cryderman took out Dave Vandereyken of Acton, Ontario, while Schwartz ran a single in a bye run. Former PBSS champion Randy Hope of London Ontario qualified fifth but was taken out in first-round action. Jeremey Van Bastelaar is crew chief for the Cryderman Farms Team, with Bob McKinnon as crew member. 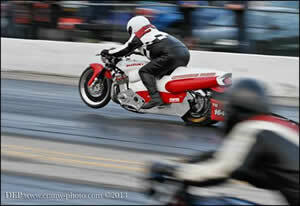 Cryderman has been drag racing motorcycles for over 20 years. Dan would like to thank Fast by Gast, Ward Performance, Raceworks Canada and Pingel Enterprises. 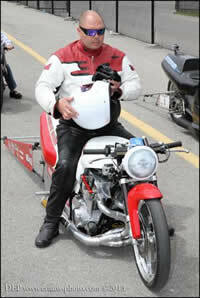 The Pro Bike & Sled Series, www.PBSS.ca, also competes with its two companion series, the Pro Modified Racing Association, www.PMRA.ca and the Quick 32 Sportsman Series, www.Quick32.ca providing fans and exciting and complete experience of drag racing action. Szoke on pace at "Twin Peaks"